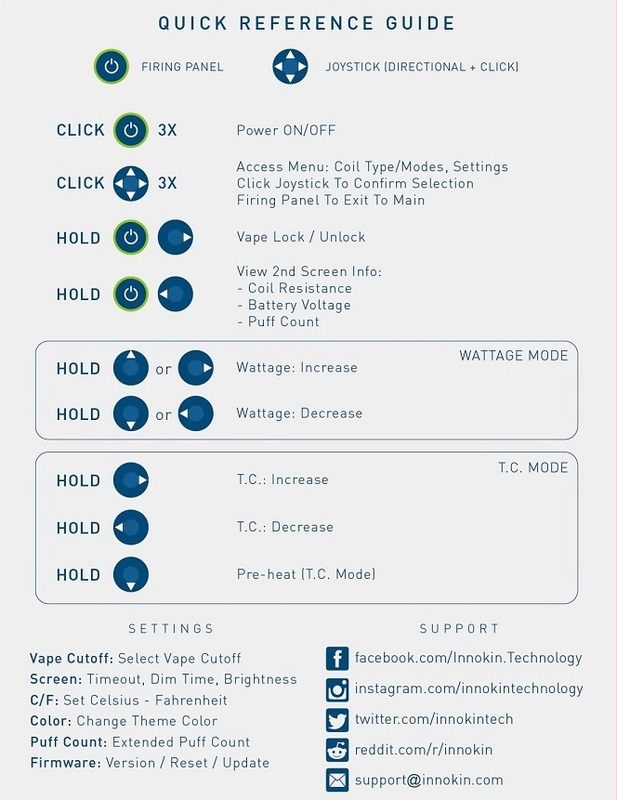 The Innokin Proton 235W vape mod is set to become a classic. 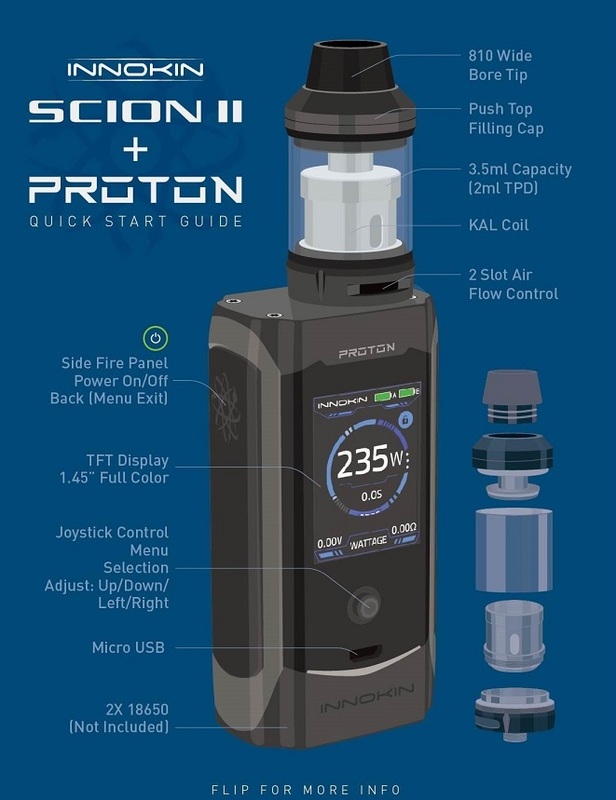 The new Proton features a brand new chipset with the new Scion II tank and Plexus Coils. It has been redesigned from the ground up. A vape mod that other brands will need to follow if they want to stay in the game. The Proton has dimensions of 85mm x 44.6mm x 29.6mm so is similar in size to the Smok Alien, slightly slimmer though. How is the Proton Different? Spare glass tube gives greater volume. The Scion II tank is already secure as a market leader and coupled with the new Proton makes an impact. 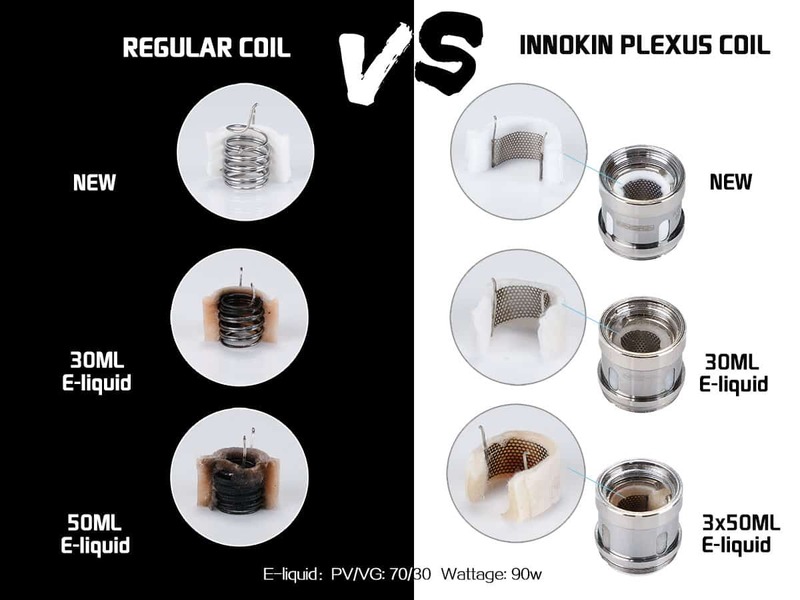 The new Plexus coils give a significantly more stable current through the e juice when vaping ie the resistance is constant. This increased resistance stability translates to a more even distribution of temperature through the organic cotton which leads to less degradation and a longer life. Couple this with increased vapour flow and better flavours than ever the Proton/Scion combination is formidable. The top-fill is not fiddly either - a simple slide lock, one click and it is ready for reload! 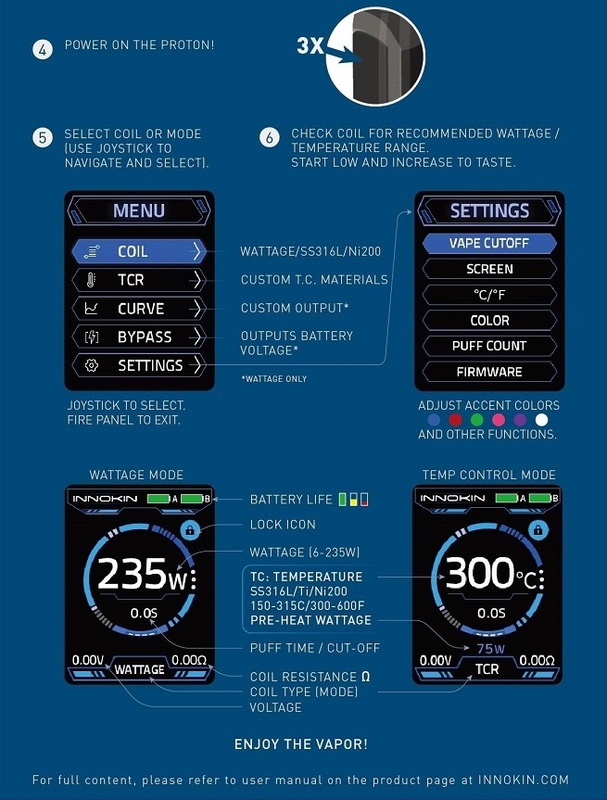 The Innokin Proton TFT screen features an easy-to-read menu and features 5 info-lines that show wattage, mode, dual battery indicator level for each cell, resistance, coil type and puff time. 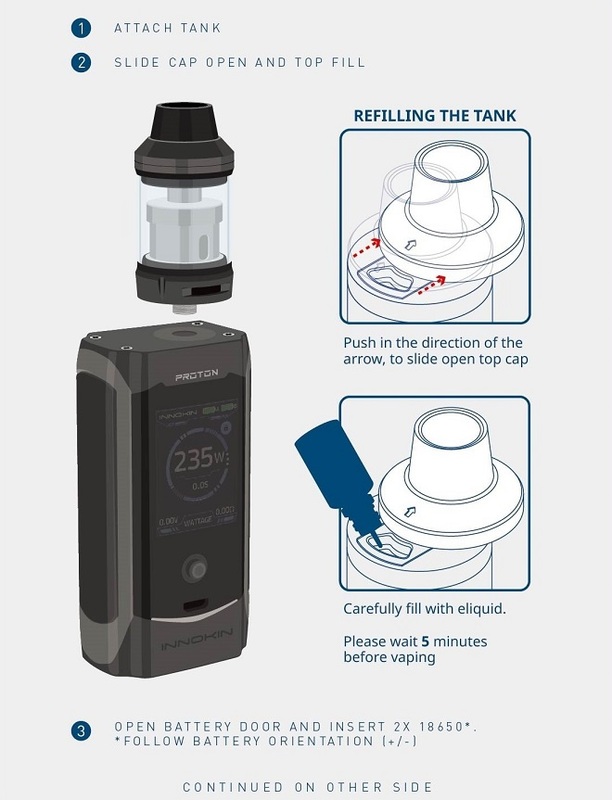 The Innokin Proton uses the standard 510 connection and on the side, the oversized hidden fire button is beautifully integrated into the design. The shell is contoured for a very smooth to the touch feel and the Innokin Proton is easy to operate using a well designed combination of USB port, TFT screen and the mouse/joystick. The Proton is aimed at the advanced vape user market and as such benefits those who are looking for big clouds and have a general knowledge of how vape mods work. However getting started in simple mode is quick and easy. Your Proton device is manufactured with precision so will not leak providing you use the product and parts correctly. Where any leaks have occurred, we have solved almost all by taking the following steps. When cleaning or replacing the Plexus coil carry out the above procedures. We recommended you vape high VG e-liquids like 70VG/30PG or 80VG/20PG. See our range of delicious cloud chasing e-liquids.